Come October 2016, Singapore’s foremost Argentine restaurant, boCHINche, will play host to a team of Argentinean experts flown in from across the world and all for one purpose: Comilona. 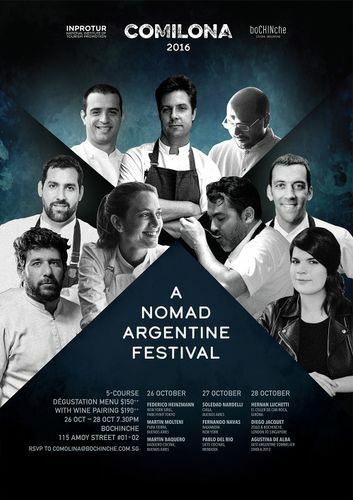 Proudly supported by Inprotur (Argentina’s National Institute of Tourism Promotion), celebrate the rich flavours and cultural excellence of Cocina Argentina with the nomad food and wine festival that celebrates the wonders of Argentina. Hosted by boCHINche and Zoilo Chef Patron and Comilona founder Diego Jacquet, the festival will culminate in a series of exclusive dinner collaborations that will showcase the present and future of Argentine cuisine. Centred around ten original Argentine products such as Argentine beef, Aji Molido, Cedron and Cumin, eight talented guest chefs and one sommelier will be whipping up a selection of 5-course dinner and wine pairing menus across three days that will change from evening to evening. Guests are required to RSVP with their name, number of diners, date of choice and contact number at comilona@bochinche.com.sg.